Any cynicism or disbelief that Israel’s Prime Minister Netanyahu was seriously interested in trying to reach a two-state solution with the PLO was dispelled this week with the revelation that Netanyahu last year offered to free 50 long term Palestinian security prisoners sentenced before the Oslo Accords were signed in 1993 - in a vain bid to entice Palestinian President Mahmoud Abbas back to the negotiating table. Abbas’s three year refusal to resume negotiations without a prior commitment from Netanyahu to freeze all building in East Jerusalem and the West Bank continues to cause US Secretary of State John Kerry growing frustration - after investing considerable time and putting the prestige of his office on the line attempting to get Abbas to backdown. Netanyahu has always made it clear that he will not commit to any such building freeze - for good reason. Once bitten - twice shy. In the bizarre bazaar that comprises these negotiations - refusing to agree to a building freeze as a condition for resuming talks apparently does not preclude Netanyahu offering an inducement to get Abbas back to the table by offering to release 50 long term prisoners with blood on their hands. Once again Abbas apparently overreached and ended up a loser yet again - as has occurred on so many occasions with the Palestinian Arab leadership since the Mandate for Palestine was established by the League of Nations in 1922. It must be crystal clear that the PLO can never agree to these conditions - which would undermine the PLO Charter claiming all of former Palestine to be an indivisible part of the Arab homeland. So too - Israel can never accept the two-state solution propounded by the PLO - a Jew-free Arab state in all the territory lost by Jordan to Israel in the 1967 Six Day War - having its capital in Jerusalem - its current 500000 Jewish population having to abandon their homes - whilst millions of Palestinian Arabs are allowed to emigrate to Israel. The two-state solution to be artificially created for the first time ever in history - as contemplated by the Oslo Accords and the Bush Roadmap - is dead in the water. Is the international community so blind in failing to recognise the impossibility of creating a second Arab state in former Palestine - in addition to Jordan - given the totally divergent and unyielding positions that both Israel and the PLO hold? More winks, nods, understandings and attempted back room deals leading nowhere seem to be the order of the day - whilst a vicious and unrelenting effort to undermine and delegitimise Israel continues with ever increasing ferocity and intensity. Waiting in the wings is another ” two-state solution” - based on history, geography and demography - that offers hope for the resolution of the long running Jewish-Arab conflict. 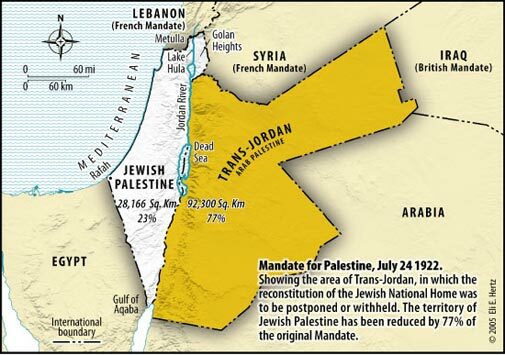 It involves allocating sovereignty in the West Bank between Israel and Jordan - the two successor states to the Mandate for Palestine. International diplomatic pressure coupled with financial, military and humanitarian aid to Jordan - rather than the PLO - would materially help in achieving this solution. Meantime - the paradox of “negotiations with the PLO that are not negotiations” will continue going south until their inevitable denouement. What cost to human suffering - both Jewish and Arab - will this pantomime continue to wreak until it finally becomes political history?